There are many things in contemplative prayer and in any kind of New Age prayer that may seem the same as Christian prayer, but there is a big difference. In this post I will point out the similarities, as well as the obvious differences between Christian prayer and the devil’s counterfeit prayer. Both kinds of prayer seek and require solitude. Don’t be fooled. Just because a type of prayer requires solitude and just because people bow their heads with a humble quiet posture, it doesn’t mean these people and their prayers are from God. New age, contemplative prayer requires solitude and quiet so one can meditate on and concentrate on a “sacred word.” This concentration is with the intention of clearing the mind of thought and to put you into a state where you are able to contact God with your soul (without the mind). But this is a trap of the devil. Whenever one tries to blank his mind out, he is opening himself up to demons. And so if that person says God is blessing him and that God is speaking to him, that is not God, it is the devil. Those who truly are seeking God with a Biblical, normal kind of prayer require solitude and seek solitude in order to reduce distractions so they can have privacy with God and so they will be able to think clearly as they pray and worship God with their mind. These do not seek to clear the mind or empty the mind, but rather they intend to fill the mind with good and holy thoughts. Their preparation is not with breathing exercises or with a mantra; rather, it is by reading, study and mediation on the Word of God. This preparation will result in the confession of sins, and a seeking after holiness and His will, which further results in a calm and peaceful spirit that rests in the presence of God. Both kinds of prayer have the appearance of true prayer. Contemplative prayer appears to be true prayer, because the pray-er has his eyes closed and has a seeking, meditative prayer posture. But he is not really praying; he is just repeating a word over and over with the intent of reaching a higher level, in order to find God and get rid of his suffering. Thus his prayers are just vain repetitions for selfish purposes. True prayer is also with the eyes closed and in a seeking posture; however, it is prayer of the heart and mind and will. This kind of prayer is thinking prayer, filled with many words that naturally flow from a heart that seeks after God. And though this prayer seeks God with many personal requests, it is not selfish, because it is ultimately for His purposes and for the good of His kingdom. Both kinds of prayer deal with suffering. Contemplative prayer has it roots in Hinduism and Buddhism. Those who pray with contemplative prayer may not admit that they do the mantra to eliminate suffering, but they do; for this is the whole idea of the mantra—to enter into a state (the state of ecstasy or nirvana) where there is no more suffering. Is this the idea of true prayer? No. True prayer deals with suffering, but it doesn’t try to eliminate it. With true prayer we seek God’s help in suffering, to win over suffering, but we don’t pray to destroy it; we pray to be able to use it for our good. Thus we pray for patience in suffering, so that it will make us perfect and complete, lacking nothing (Ja. 1:2-4). Furthermore, unlike contemplative prayer, true prayer does not seek to empty the mind, and therefore weaken the personality and the individuality (which is the goal in Hinduism); it rather strengthens the mind and the personality, and gives hope and renewed confidence. 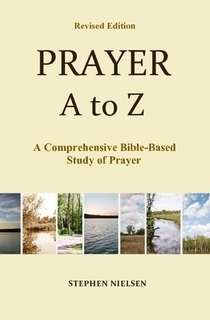 This entry was posted in Part 4, How the Devil Tries To Pervert Our Prayers, Prayer A to Z Excerpts, Quietness in Prayer and tagged prayer, Satan, solitude, suffering. Bookmark the permalink.